Book also available in two other versions : here with child alone, here with two siblings. Age : 2-8 ans. Now your child, and the whole family gets to be in the most enchanting extravaganza ever conceived: Swinging, balancing high above the crowd, clowning, juggling, taming the tiger... while the audience clap and gasp aloud. Book Description : 28 pages, size: 20 cm x 20 cm, with thick high quality paper, using professional digital printing, and a durable laminated cover. Detailed description & page through book by clicking here . Age : 2-8 years. Now your child and the whole family get to be in the most enchanting extravaganza ever conceived: Swinging, balancing high above the crowd, juggling, and taming the tiger while the audience claps and gasps out loud. Dad is a multi-talented musician who works with the horses while Mum juggles and swings from the trapeze. Brother or sister outdoes everyone by tossing and juggling from a unicycle! The charm of delicate watercolours comes to life with the help of bright mixed media, showing off the lights of the circus in all their brightness. 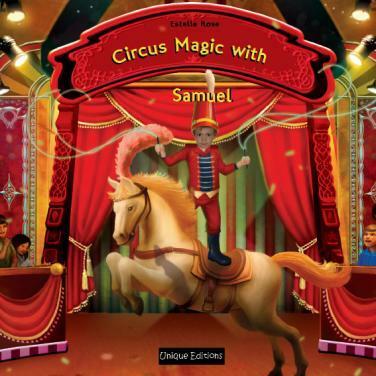 Circus Magic makes your child’s fantasies of being a circus star come true. Personalisation: The photo of the child appears 16 times, the name and family name 14 times. Mum and Dad appear 6 times in the book, and the sibling twice. There is also an option to create your own personalised message to the child, that appears at the beginning of the book. Bring a sibling into her personalised stories. Your child can identify the faces she loves, and that takes her deeper into the story. Your child’s relationship with her own image is like the climbing of a ladder. According to Dr Sears, parents can nudge baby's progress so that she begins to love the tot in the photograph or book. Self-esteem, he says, is "the passport to mental health and (…) happiness." Packing every step of her progress with positive feelings goes a long way towards improving her self-esteem. A personalised childrens book that puts her in the leading role of a book can aid this process. A photo book gives parents a door into communication with tot about the way she sees herself. It emphasises her uniqueness while giving mum and dad an opportunity to speak and bond with her in a way that otherwise wouldn't be possible. The delight a toddler feels at seeing herself as the star of a personalised book is difficult to top. A charmingly illustrated tale grasps her focus, and tells her she's special. When she has the spotlight during personalised story-telling time and mum and dad are on her level, she's more likely to reveal herself. Mum and dad have the chance to help her grow a healthy self-esteem. The resulting growth will serve her throughout her adult life.